When it comes to reading the classics, it's often difficult to know where to start. Those of us who majored in English were spoiled, we had professionals point us in the general direction of the world's best literature with little to no solicitation. But what about those who majored in something else? What about readers who never went to college . . . or haven't finished their secondary education yet? This is where The Dover Reader series comes in. The Dover Reader is a series from the fine folks at Dover Thrift Editions, home of the cheap and cheerful paperback, which collects some of the most famous works of noted literary giants. If you have ever struggled to find your way in the literary cannon, here are your compasses. 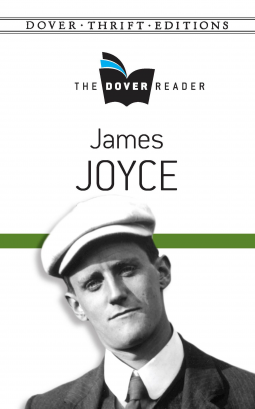 Recently, I requested the newest addition to The Dover Reader*, this one on James Joyce, on Net Galley and the publisher was kind enough to share it with me. This volume contains The Portrait of the Artist as a Young Man (the most accessible of Joyce's novels); all of the stories in Joyce's Dubliners collection; an excerpt from Joyce's magnum opus, Ulysses; his play Exiles; and Chamber Music, an early book of poetry that predates Joyce's fiction. What makes this volume a superior introduction to Joyce, is the organization of the works. In many ways, Joyce's reputation for impenetrability proceeds him. The volume begins with Dubliners, a short story collection, which allows readers to "get a feel" for Joyce's prose and, if need be, skip between stories. Next, the volume transitions into The Portrait of the Artist as a Young Man, the most accessible of Joyce's novels, which is then proceeded by the first episode of Ulysses, Telemachus, where Portrait's Stephen Dedalus is a prominent character. While the inclusion of the Telemachus chapter make sense in terms of character continuity, it's not the best representation of Ulysses's narrative beauty. For the purpose of best representing Joyce and Ulysses, I can't help but think the Sirens or Penelope chapters would have been preferable inclusions. This collection wisely concludes with Exiles, Joyce's only published play (written around the same time as Dubliners) and Chamber Music, a poetry collection written early in his career, allowing readers interested in Joycean "deep cuts" to have their fill. Taken as a whole, this collection is a comprehensive, accessible introduction to Joyce's work and provides the reader glimpses into some of the lesser read corner's of his his bibliography. The Bottom Line: If you're a Joycean noob and want a gentle introduction to his work, this is a great place to start. If, on the other hand, you are an experienced Joyce reader, you would probably find it more useful to seek out single editions of the author's longer works, most of which are also available from Dover.